Our New Year's Eve was a busy day. I made up gingerbread for our houses while Ryan hosted a couple of co-workers to jam for a few hours. One of them brought his two oldest with him, so Gareth and Mal played with his kids while the adults baked/played music. We didn't puzzle this year. In fact, due to our extreme lack of storage, we culled our past puzzles quite extensively. Instead, Gareth played Minecraft with the aforementioned kids until midnight while Ryan and I watched some shows and munched on cheese and crackers. This year we tried Manchego and a cranberry Wensleydale. On New Year's Day we had friends over to decorate the houses. Typically I put the houses together the night before, but this year I ran out of time. The kids played for a bit while I finished building the houses, then decorated. 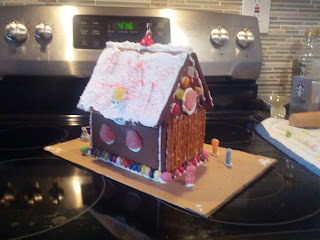 I didn't get a picture of the one they all worked on, but it was covered in candy and frosting. The kids ate almost as much candy as they put on the house. They tired of decorating after one house, so I had mostly free reign with the second house, though Mal helped me quite a bit. I didn't want to put a lot of effort into the roof, so hence the icing with sugar sprinkled on top. Pretzels work well to cover a lot of surface quickly as well as for making windows and doors. 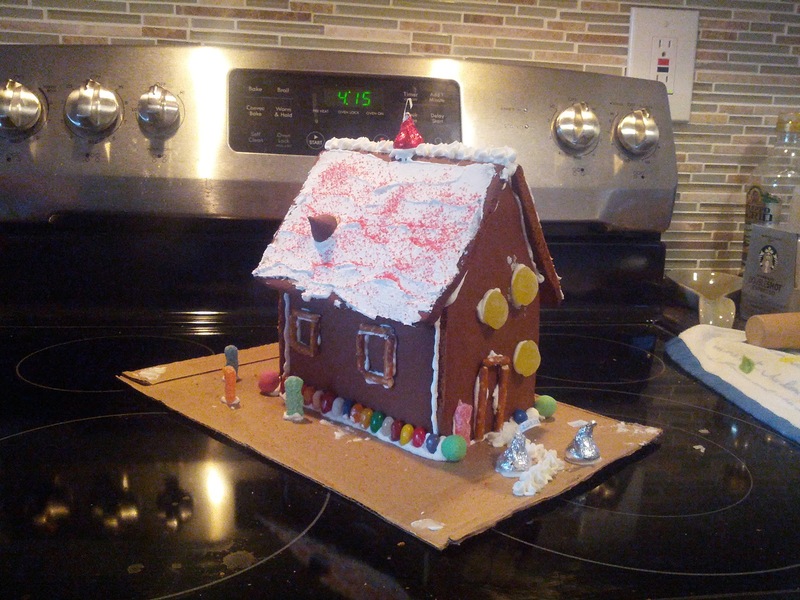 After dinner Gareth informed me that the house wasn't decorated enough, so he added a few more candies. And that closed our New Year's Day. Mal was asking to go to preschool today, so I think we're all pretty ready to get back into the usual routine.